Have you ever wanted to find out something specific about our Nature Study Area in Ottawa’s western Greenbelt? You might look around on the Macoun Club website and find just what you’re looking for, but you would soon realize that the information is either highly summarized, as is the case with our Butternut Canker survey, or lacking details, as in our regular field-trip write-ups. We have always kept records about all kinds of things we observe on our many field trips — the vital statistics of each Butternut tree, which birds nest where, and when the pond ice first forms and melts. 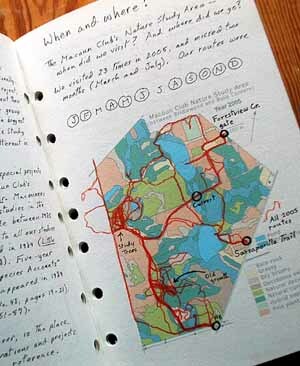 For more than 45 years, a wide range of information has been set down in personal notebooks. If you could ask the right person, they would try to dig out the facts for you, and then you could piece together that facet of natural history that really interests you. But as the months, the years, and the decades pass, people move, notebooks are put away in boxes, and even from notebooks kept on the shelf, information retrieval becomes dependent on an ever-less-efficient memory. 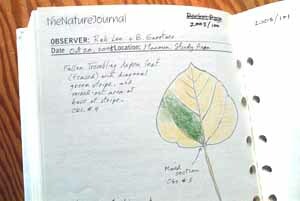 To solve these problems, in 2005 we began to keep a comprehensive group record of Study-Area observations, written by hand in archival format in a NatureJournal© kit developed by Aleta Karstad. Aleta’s format is flexible, and we have easily adapted it to our purposes. Each field-trip account begins with a colour-coded vegetation map, on which we mark the day’s route. Next comes a black-and-white, outline map that provides the number codes for each habitat unit, which may be referred to in the text. The names of the person writing the notes, and all the other observers present, together with the date and times, appear at the top of each page. Specific locations are given for each observation within the text. Although 99.9% of our observations have been identifed, we also write down or draw the details of certain mysteries we encounter, with the hope that with this record will one day enable us to understand it. Under Aleta’s guidance, it has been our intention from the beginning to bring all our observers’ notes together into a single volume each year. Because all of us are writing on pages from the same kit, everything fits together very nicely. Some things are best done at year’s end. Thinking of this project as the making of a book, we create a Table of Contents, in which each field trip is characterized by its one outstanding memory. A Preface explains the scope and purpose of the book, so that everyone knows what they are dealing with, even if they have never been to the Study Area. By compiling all our field-trip routes for the year on a single map (left), we can see at a glance where our obervations were concentrated, and what areas we failed to investigate. A row of letters represents the months of the year, with those covered by our observations circled. We write a summary of each species, elaborating on seasonal or behavioural features of the population. This is an opportunity to relate our current Study-Area sightings to broader perspectives. Any specimens collected are referenced by their catalogue numbers, on pages Aleta has supplied for the purpose. We also make a list of GPS coordinates for handy reference. Finally, we print out the year’s Index on NatureJournal© pages. 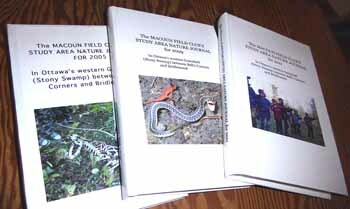 When all this is done, we make a photocopy of the entire Nature Journal (which is a unique, one-of-a-kind book), and from this master version, make additional copies so that they can be shared among Macoun members, the National Capital Commission, and the Ottawa Field-Naturalists’ Club. We design a cover, and then send the original notes and all the copies away for binding. Pages and PAGES of notes! What will they ever be used for? One of the greatest obtacles to any understanding is lack of knowledge about the subject. Hundreds of people pass in and out of our Nature Study Area every day– walking their dogs, riding bikes, enjoying the place with their families. Can you imagine how few would be able to tell you afterward what kind of creatures they saw signs of? And among those few, would any be able to say anything useful a week, a year, ten years later? There are birdbooks, and mammal books, and wildflower books that list all the species for many regions around the world. But if you’re looking at this particular place and want to know how many years since the last Meadowlark sang, or the first Purple Loosestrife plant sprang up, odds are the only place you’ll find the answer is in someone’s handwritten notebook. In an example of how the most ordinary information can be assembled and put to use, a researcher in Vancouver, B.C. recently mapped the spread of the Eastern Gray Squirrel throughout the city over a period of 30 years. * (This is important because this is an introduced species there.) This biologist got her information from hundreds of citizens who volunteered their information — whether they had these rodents in their neighbourhood, and for how long. We have similar questions. Has our Study Area always looked like it does now? When did all our invasive species arrive? Have they had any effect on the natural ecosystem? If you know what questions to ask ahead of time, you can plan a scientific study. But if the question doesn’t arise until there is a problem, you have to look back in time, and good field notes are going to be your best source of information. We aim to keep good notes. * The study on Gray Squirrels mentioned two paragraphs above was published in a recent issue of the Canadian Field-Naturalist. There are lots of interesting things in every issue of this journal about Canadian wildlife, but many people seem to be put off by the professional tone of the articles. All images donated by Macoun Club leaders, members, and parents. Created Nov. 17, 2006. Coding and time-sensitive elements revised May 13, 2016.